Mormons Leaving The Church WHY? BRAD: According to this article a lot of Mormons are starting to leave the church in droves. Some of the reasons are gay marriages, and polygamy. SALT LAKE CITY (Reuters) – A group of about 150 Mormons quit their church in a mass resignation ceremony in Salt Lake City on Saturday in a rare display of defiance ending decades of disagreement for some over issues ranging from polygamy to gay marriage. The Utah-based Church of Jesus Christ of Latter-day Saints is known for its culture of obedience, and the mass ceremony was a seldom-seen act of collective revolt. After gathering in the park, participants hiked a half-mile up nearby Ensign Peak, scaled in 1847 by church President Brigham Young to survey the spot where his Latter-day Saints would build a city. At the top, those gathered gave three loud shouts of “Freedom,” cheered, clapped and hugged. The church bills itself as the one “true” Christian faith, and its theology promises families eternal relationships among those who remain faithful, sealing those gifts through special religious rites. Among the reasons cited by those resigning are the church’s political activism against gay marriage and doctrinal teachings that conflict with scientific findings or are perceived as racist or sexist. Others cite inconsistencies in the Mormons’ explanation of its own history, including the practice of polygamy. The church renounced plural marriage over a century ago as Utah was seeking statehood. RAY: I wonder if some are leaving because they want Polygamy and want Homosexuality as norms to follow or if it is in rejection of these practices. Mormons over the years have separated from the main LDS church in order to pursue Polygamy which was one of the original sanctioned lifestyle choices of the Mormon church when it formed in the 1800’s. 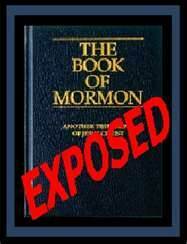 It must be remembered that Mormons already left the true church that is described in the Holy Bible when they followed Joseph Smith and the book of Mormon which is extra-biblical. No matter what church whether Mormon or any other you belong to, you may not be part of the true church of God even if you regularly attend church services. The true church (body) of Christ is comprised of those who have a personal relationship with the Lord Jesus Christ and who have received the pledge of their salvation. Many have not received this pledge (called earnest in the KJV & SKJV).